Venezuela has been one of Dominica's best friends for decades, as far back as the early years of the Dominica Freedom Party administration of Dame Mary Eugenia Charles. 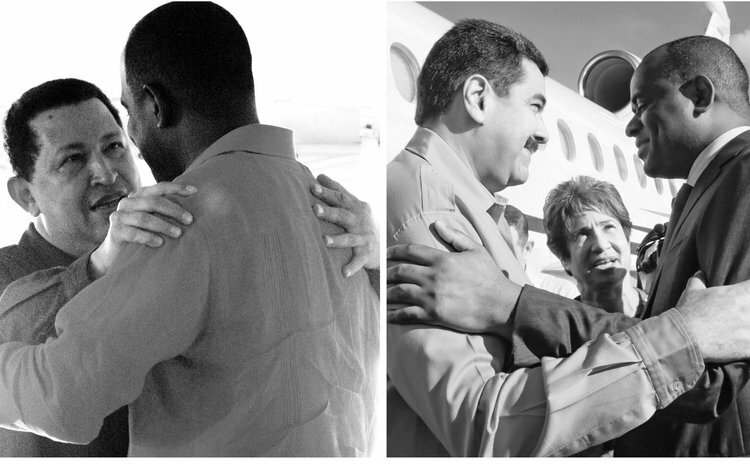 That relationship was accelerated and, some people say, exploited by Prime Minister Roosevelt Skerrit especially during the reign of Venezuelan President Hugo Chavez. Or was it Chavez doing the exploitation to promote his regional and international agenda especially under ALBA? But we believe it makes sense to suggest that now that Venezuela has undoubtedly plunged into a deep economic and social precipice, Dominica, and the rest of CARICOM for that matter, must make urgent moves to help that Latin American country deal with its economic and social problems. Otherwise the situation there could become unbearable and that may begin to adversely affect Dominica and the rest of the region. Some countries have begun feeling the effect of Venezuela's economic collapse. But before Dominica and CARICOM offer their assistance, probably in the form of mediation between the warring parties in Venezuela, the Nicolás Maduro government must first admit that the country needs help urgently. That acknowledgement, that Venezuela is in deep financial and economic trouble, only came recently from the embattled president. For instance, Maduro reportedly told the PSUV party congress that "the production models we've tried so far have failed, and the responsibility is ours—mine and yours." Also recently, as further acknowledgement of the government's realization that Venezuela cannot continue in crisis mode forever, the Maduro government has decided to devalue the bolivar as part of the government's plan to curb hyperinflation. From last week, new banknotes denominated in "sovereign bolivars" are legal tender, with five zeroes deleted. These measures came after the International Monetary Fund (IMF) predicted that inflation in Venezuela could reach one million per cent this year. Yes, an unbelievable one million percent. That's what Alejandro Werner, director of the IMF Western Hemisphere department, wrote in a post on the agency's blog: "We are projecting a surge in inflation to 1,000,000 percent by end-2018 to signal that the situation in Venezuela is similar to that in Germany in 1923 or Zimbabwe in the late 2000's". But Venezuela neighbours in the Caribbean must do much more than just stand aside and look. Our leaders must act, with the obvious approval of President Maduro and the opposition forces aligned against him. An especially troubling situation for Venezuela was the deportation of its nationals from Trinidad and Tobago earlier this year. You may be aware that millions of Venezuelans have been leaving their country in droves because of the economic and social situation there. The United Nations has reported that so far 2.3 million (from a population of 32 million) people have fled mainly to Colombia, Ecuador, Peru and Brazil. "People cite lack of food as their main reason for fleeing, with reportedly 1.3 million people suffering from malnourishment," said UN spokesman Stephane Dujarric at the UN headquarters. "There are also severe shortages of basic medicines and medical supplies, which have led to a sharp deterioration of the quality of care in hospitals." Of particular concern to Dominica and CARICOM is the ongoing confusion over the future of the Petro Caribe arrangement because of the crisis in Venezuela. A number of Caribbean countries have expressed concern over the delivery of oil under that scheme started many years ago by Hugo Chavez. It has helped delay the decline of the foreign exchange reserves of some CARICOM countries and these countries hope the Petro Caribe agreement will continue. A further indication that Venezuela is in serious trouble was a recent attempt to assassinate President Maduro with drone missiles. Last week, at least 14 military people were arrested and blamed for the drone attack. At the outset of the investigation into the attempted assignation, Maduro blamed the Colombian government and rebel elements in the United States. Since then Columbia has strongly denied the allegations and US National Security Adviser John Bolton also denied any US involvement in the incident, adding that it could be "a pretext set up by the regime itself". Prime Minister Skerrit was one of the few OECS leaders to condemn the attack on Maduro. But Prime Minister Skerrit, Venezuela's main friend, and the chairman of CARICOM, Jamaica's Prime Minister Andrew Holness must acknowledge that the economic wellbeing of the region is tied to Venezuela. If Venezuela goes down the region to some degree goes with it. Hence, the people of the Caribbean must urge their leaders to make positive moves at helping Venezuela; a friend indeed is in need.